History of the Coos Bay rail line with a timeline of the railroad. The Port partners with CBR to operate the line. Port owned railroad. The Port owned and operated Coos Bay Rail Line (CBRL) transports approximately $220 million worth of freight in and out of our region every year – and has kept over 100,000 trucks off the road since the Port of Coos Bay reopened the line in 2011! These products originate from and travel to various destinations throughout the United States, and even have some international destinations like Quebec, Canada. About 99% of the product moved on the rail line is related to the timber industry. Some in bound products come to our area to be finished, while other products leave on the line to be finished or to their final destinations. For example, one of our shippers finishes plywood at a plant in Coquille. The Coos Bay Rail Line brings in products to the plant from Canada, Georgia, Alabama, and other locations to be finished. Once the plywood is finished, it goes back out on the rail line, some destined for Home Depot and Menards distribution centers. Product travels to the Union Pacific interchange near Eugene on the Coos Bay Rail Line, where it is connected with the National Railroad system. One railcar has the capacity of 3.3 truckloads, which provides significant savings to shippers, reduces greenhouse gas emissions by approximately 75%, and reduces traffic congestion on the highway system. Every year, the railroad celebrates its anniversary on October 11 which is when freight rail services was re-established to manufacturers in western Lane, western Douglas and Coos counties in 2011. The Coos Bay Rail Line directly employs 14 people. In addition, CBRL has 12 customers with inbound and outbound cargo consisting of wood products, fertilizer, and organic dairy feed. Revenue car loads for 2015 reached 7,341 cars and the traffic on the line is expected to maintain around 7,500 cars annually. This is equivalent to about 24,750 truck loads. 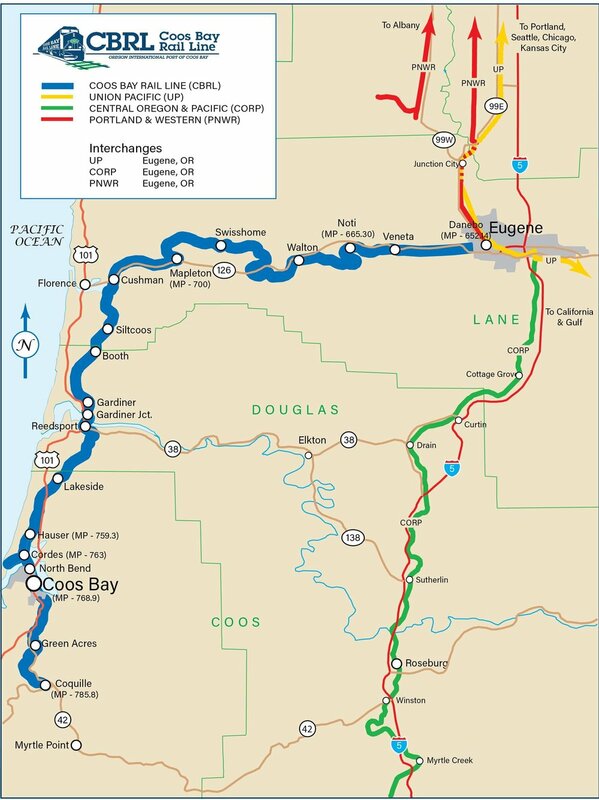 The Port of Coos Bay is continuing oversight of rehabilitation of the 134-mile Coos Bay Rail Line in Coos County and western Douglas and western Lane counties. These projects ensure the vitality and safety of this critical transportation link for years to come. Think safety at all railroad crossings. Remember, it is illegal to trespass in the railroad right-of-way. The Coos Bay Rail Line partners with Oregon Operation Lifesaver and reminds everyone to Stay Off! Stay Away! Stay Alive! Click here for details on scheduling an Operation Lifesaver safety presentation. Beginning in the late-1800s, logging trains worked in remote forested areas bringing logs to rivers and the Coos Bay, Oregon, harbor. Coal moved by rail from mines in the region to sailing ships and later steam ships for export to San Francisco. Coos Bay’s maritime commerce has been an anchor for employment and stability for generations of families in the region for more than 100 years. Ultimately, the building of the Coos Bay Rail Line created more opportunity. Products moved by rail from Oregon's Willamette Valley and Roseburg to Coos Bay for export. Rail moved products that came to Coos Bay by ship and from local manufacturers to markets across North America. As Oregon’s economy expanded, ebbed and diversified – southwest Oregon’s regional prosperity has been built upon the essential infrastructure of the port and rail line. This 134-mile rail line has supported Oregon’s economic vitality, providing businesses with direct, efficient and cost-effective access to regional, national and global markets for generations. To this day, rail remains the most efficient, cost-effective and environmentally sound way to move freight via ground transportation. Then came September 2007. Following decades of neglect and underinvestment, Central Oregon & Pacific Railroad and its out-of-state hedge fund owners and management closed the rail line with one day’s notice to shippers. The investors wanted to tear up the line and sell it for scrap. They did not see the economic and societal value of maintaining freight rail service. The immediate economic impacts of this closure on south coast communities, including Douglas County communities, was severe. Recognizing the severe impact the rail line closure was having on local business and families, the Oregon International Port of Coos Bay reached out to community members and business partners. Following community and regional discussions, the Port met with state and elected officials and developed an action plan. The Port spearheaded a legal effort to acquire the railroad and reopen this shipping option. Acquiring the railroad was a lengthy process that was successful due to the unified effort of regional businesses and state and federal officials. The Port filed a feeder line application with Surface Transportation Board (STB), resulting in the railroad immediately filing an action to abandon the line. The Port spent one year and $1.5 million in legal fees pursuing the application and defending against abandonment. The Port of Coos Bay acquired the freight rail line in 2009-10, following an STB decision. The sale totaled $16.6 million, with the Port utilizing a $4.6 million state loan and $12 million reallocated from the Coos Bay Rail Bridge repair fund. Since then, the Port has applied for and successfully received state and federal funding to rehabilitate the line. These rehabilitation projects ensure the viability for the rail line for the regional shippers and the economy of Southwest Oregon. The Port thanks all of its state and federal funding partners for investing in the future of Southwest Oregon and the Port as a gateway for Oregon goods to get to market. Today, service is restored and rail shipments interchange at Eugene, Oregon, with the Union Pacific Railroad, and other regional shortline rail operations. The rail line is operating as a subsidiary of the Port as Coos Bay Rail Line Inc. serving the Coos County, western Douglas County and western Lane County region of southwest Oregon, linking the Coos Bay harbor to the North American rail system. Environmental Stewardship is a core value for the Oregon International Port of Coos Bay. Ensuring that our activities are executed in an environmentally sound and sustainable manner ties directly into our mission to promote sustainable development that enhances the economy of southwest Oregon and the State. The Port continues to engage in a number of projects in recent years, including the purchase of electric vehicles for the Charleston Marina Complex, LED light installation in the Charleston Marina, and wetland mitigation in the East Bay. Another way the Port aims to mitigate impacts on the environment is through the Coos Bay Rail Line. The Association of American Railroads (AAR) reports that railroads are the most environmentally sound way to move freight over land, being approximately four times more fuel efficient than trucks. These efficiencies translate into reduced greenhouse gas and other emissions, by as much as 75%! Efficiencies in freight rail transport have been increasing over time. In 1980, railroads were moving one ton of freight an average of 235 miles on one gallon of fuel. By 2016, railroads were moving one ton of freight an average of 468 miles on just one gallon of fuel, which translates to a 99% increase in efficiency (AAR, 2017). The Coos Bay Rail Line is a member of the Environmental Protection Agency’s (EPA) SmartWay Program, which is designed to assist companies advance supply chain sustainability through measuring, benchmarking, and improving freight transportation efficiency. The SmartWay Program reports that between 1990 and 2013, freight movement increased by approximately 50% in the U.S., and projected that freight movement will continue to grow by another 50% by 2050. This will increase existing congestion challenges on our highway systems, and increase overall greenhouse gas and other emissions. The Smartway Program is voluntary, and provides a number of activities to support environmental stewardship. Smartway provides a comprehensive and well-recognized system for tracking and documenting information about fuel use and freight emissions across supply chains, and reduces freight transportation related emissions by increasing advanced fuel-saving technologies. Shipping freight by rail as opposed to truck has significant impacts on reducing highway congestion, as well. Highway congestion has significant economic impacts on shippers, and economic and environmental impacts on everyone. According to a study by the Texas Transportation Institute in 2015, highway congestion cost Americans $160 billion in wasted time (6.9 billion hours) and wasted fuel (3.1 billion gallons) in 2014. Time and fuel costs result in lost productivity and cargo delays. Since a single freight train can replace hundreds of trucks, increased utilization of freight rail has significant positive impacts on our transportation system and environment.